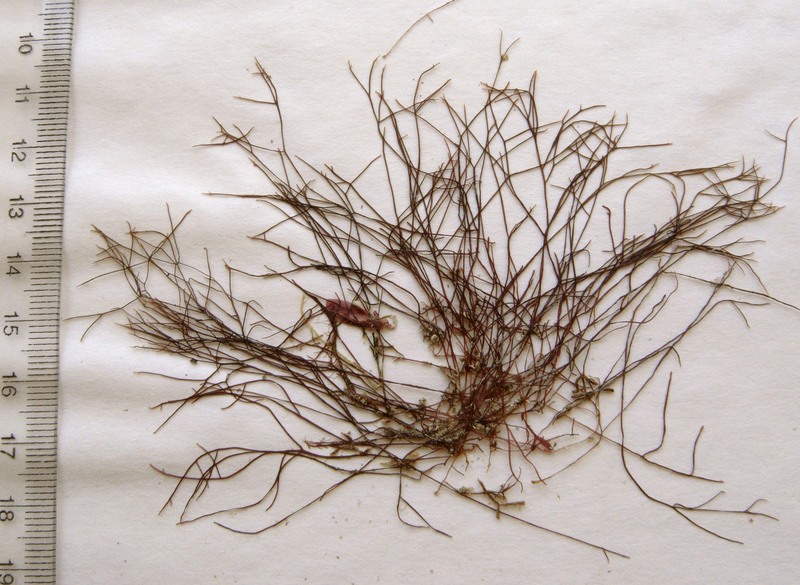 Plants dark red to blackish, erect, bushy, to about 10 cm tall, comprising slender, terete to slightly flattened, irregularly-branched uprights arising from prostrate stoloniferous system attached by small discs; uprights 350-500 µm in diameter. Structure pseudoparenchymatous; in transverse section inner medulla of narrow cells (about 20 µm diameter), outer medulla of slightly larger cells (about 35 µm diameter) grading into cortex of small cells (outer cells about 10 µm long). Tetrasporangia in sori in swollen distal tips of usually unbranched axes, cruciately divided, surrounded by small-celled interstitial filaments; cystocarps immersed in enlarged, warty branch tips. Eulittoral fringe, Hluleka to northern Kwazulu-Natal(45-58) and East Africa. World distribution: widespread in many temperate and tropical waters (as Gelidiopsis variabilis), including tropical West Africa (Guiry & Guiry, 2009). Type locality: Madras, India (Silva et al. 1996). Note: This species was formerly known as Gelidiopsis variabilis (J. Agardh) Schmitz, but Norris (1987) combined the genus Gelidiopsis with Ceratodictyon. 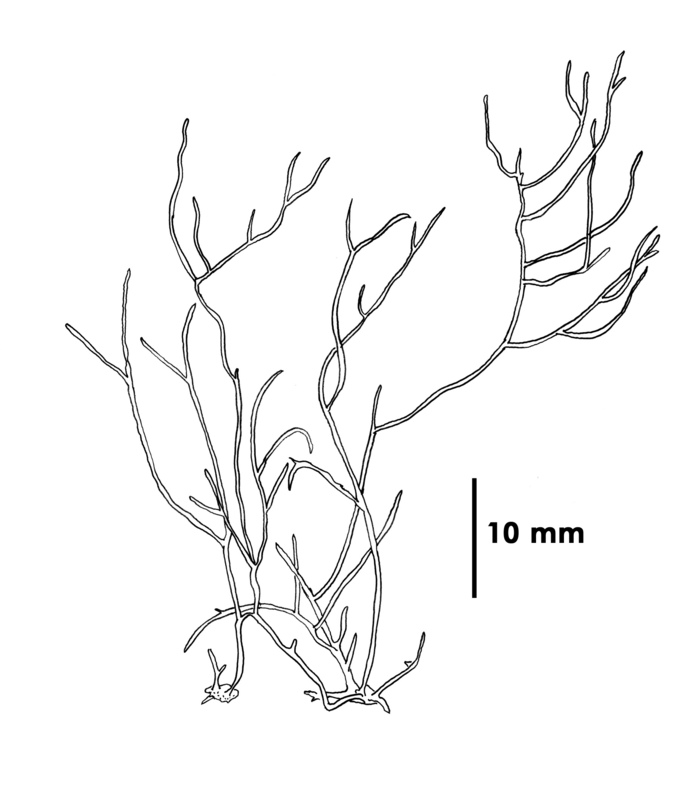 Ceratodictyon variabile, re-drawn from Norris (1987) Fig. 1. 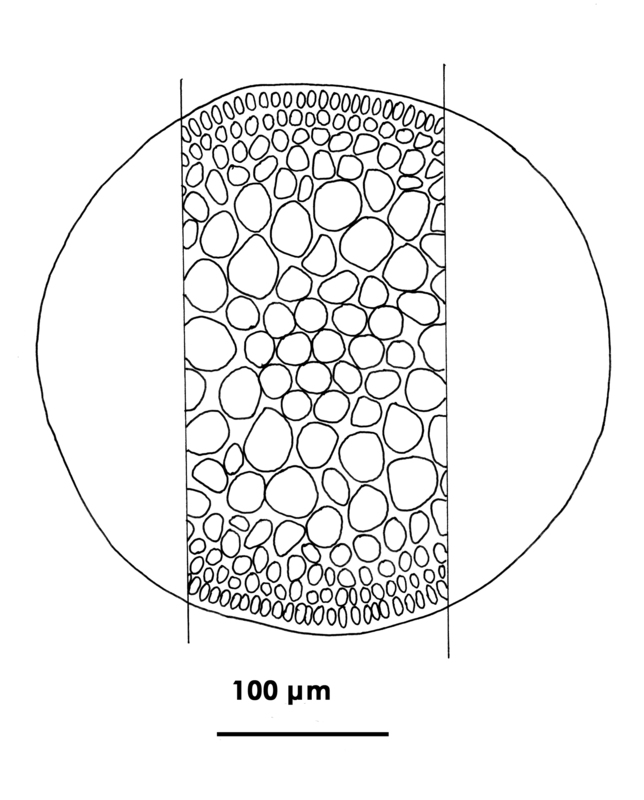 Ceratodictyon variabile, cross section of mature branch, re-drawn from Norris (1987) Fig. 3. Norris, R.E. 1987. The systematic position of Gelidiopsis and Ceratodictyon (Gigartinales, Rhodophyceae), genera new to South Africa. South African Journal of Botany 53(3): 239-246. Guiry, M.D. & Guiry, G.M. 2009. AlgaeBase. World-wide electronic publication, National University of Ireland, Galway. http://www.algaebase.org; searched July 2009. Silva, P.C., Basson, P.W. & Moe, R.L. 1996. Catalogue of the benthic marine algae of the Indian Ocean. University of California Publications in Botany 79: 1-1259.